The high yield fixed income market, also known as “junk bonds” is often one of the most misunderstood asset classes by many investors. In recent years with interest rates at historically low levels, many investors have attempted to look at different investments to enhance the cash flow generated from their portfolio. One such area has been the high yield marketplace. High yield bonds by definition are bonds that pay a coupon (interest payment) in excess of the normal interest rate environment as a result of their lower credit quality. They are typically below investment grade debt instruments. There are several different rating agencies that rate fixed income credit quality. One such agency is Standard & Poors (S&P). S&P ratings indicate any fixed income position with a rating below BBB is classified as below investment grade or “junk” status. The term “junk” can sound quite derogatory in nature, and may insinuate that it is something to stay away from. This is not necessarily the case. There is almost always a place for lower quality fixed income within the confines of a longer term investment plan. The first thing to understand is how high yield bonds correlate to other assets. Most fixed income investments are inversely correlated to interest rates. That means that when interest rates are rising, an existing bond offering a lower interest rate declines in value. The relationship here is simple to understand. Imagine that you hold a bond issued by a corporation that matures in 10 years and pays 5%. If rates rise to the point that the 5 year treasury pays 6%, why would anyone want to buy your bond paying 5% when they have to wait twice as long to get their investment back? The answer is that they likely wouldn’t. As a result, if you attempted to sell your bond early, it would sell at a discount (loss) from your original purchase, if you bought it as a new issue. This is known as interest rate risk. Yet, high yield bonds generally function in the opposite manner. As a result of the substantially higher rates paid, the emphasis of concern in pricing these instruments is rooted in the issuer’s ability to pay back the original principal payment due to the lower credit quality of the issuer. 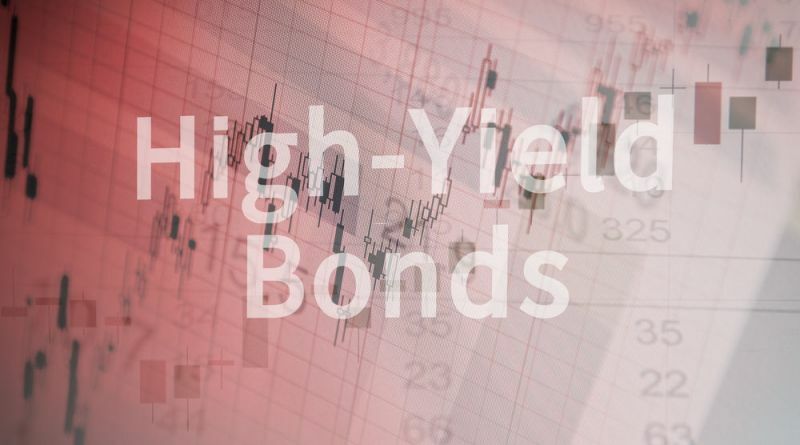 High yield bonds are classified as below investment grade because the underlying company is perceived to have a less stable set of financial conditions. The reason for the positive correlation with interest rates is based on this concept of solvency. If interest rates are rising, this is generally perceived as the result of the Federal Reserve increasing rates to slow the growth rate of the economy and prevent higher inflation. Since the economy is theoretically expanding, the probability of a company surviving through more prosperous economic times has therefore likely increased. Hence, their ability to repay their debt obligations has also likely increased. Likewise when rates are declining, that is usually indicative of some concern of an economic contraction, and perhaps even a recession. While in a period of contraction, the earnings of Fortune 500 companies may decline. However, it is typically unlikely that these large multinationals will go bankrupt. In the case of less credit worthy companies, a company that already has financial concerns will likely find it much more difficult to weather the economic storm. Therefore the ability to satisfy their debt obligations will be called into question. It is for this reason that the high yield bond market tends to move most often with interest rates rather than against them. High yield bonds also tend to get issued without “call protection” on the individual bonds. A callable feature is an aspect of a bond issuance that permits the issuer to redeem the bond early if the economic environment of the company improves. In such a scenario where the growth of the company is so strong that they are no longer considered to be a credit risk, or of junk status, they may opt to call in some bonds, and then issue newer debt at lower rates based on their improved financial condition. However, this means you as the investor will not see the return you anticipated had you been able to hold the issue until its full maturity. What about buying individual High Yield Bonds? In general, it is not prudent for the average investor to buy high yield bonds individually. The risk of repayment can be enormous. The key to buying into this market is typically diversification. The majority of retail investors will not likely have the capital to broadly diversify this portion of their portfolio across hundreds of holdings. Furthermore, the likelihood that the average investor has completed the necessary financial analysis in each individual company’s financials is also improbable. Most investors will be served far better by capturing exposure to these areas through mutual funds and ETF’s. The purpose of buying into this area of the market is that it serves as a potential hedge against interest rate risk. Should an investor have a fixed income portfolio of treasuries, government agencies and good quality corporate bonds, they will be exposed to the negative/inverse correlation when rates rise over time. As a result, having a small portion of your fixed income portfolio allocated to this area of the market will offset a portion of that risk, while simultaneously paying a higher income. Such a holding simply balances the risk associated with the better quality debt holdings. It is important to note that these positions are typically a much smaller percentage of the overall holdings than that of traditional fixed income. In cases where a portion of your portfolio is exposed to stocks or stock funds, it should also be noted that high yield bonds may correlate closely with them as well. The correct percentage exposure in an individual’s portfolio is going to be specific to that person’s financial goals and time frame. The same can be said of any asset class, as each situation must be addressed in a unique manner. While their performance is often dictated by different economic environments, it is still not prudent to attempt to time these cyclical trends. As is the case with any asset class, pricing is often reflected in anticipation of a changing environment, and exploiting shorter term price inefficiency can be very difficult, and even more challenging to accomplish on a consistent basis. High yield bonds are generally classified as a higher risk investment, and should be treated as such. Yet, from a financial planning perspective, when used appropriately in the proper proportion of an individual portfolios overall asset allocation, they will likely bring down the overall risk of your investment strategy by reducing the correlation across portfolio holdings. As with any asset class, it is advisable that an investor discuss this with their financial advisor and complete their due diligence before taking a position.